One of the best things about a Jeep is its ability to go nearly anywhere the driver can imagine. We push it through sand or mud, up steep hills, over logs and rocks, all in the name of adventure and thrills. There are many reasons why Jeeps don’t fail in those conditions – small wheelbase, lighter weight, solid frame, ultra-flexible suspension, quality knobby tires, etc. But one of the main reasons for successful outings is one you can’t see with a glance at the rig. But it really is the vehicle’s performance backbone – an extremely well-engineered transmission system. Regardless of manual or automatic set up, the gears are designed for maximum execution in the most challenging on- or off-road conditions. But how does it all work? What’s the point of each setting? How does one make the best use of the gears? Generally speaking, Jeeps are equipped with a dual transfer case, meaning a second case is located behind the transmission case and acts to transfer torque to only the rear differential or to the front and rear at the same time. A setting in which four-wheel drive is engaged at all times and the driver can travel safely and securely on all surfaces. Regardless of whether the road is dry, wet, or covered in snow, the driver can maneuver with confidence. The system uses either a clutch or a center differential to allow the front and rear drive shafts to turn at varying speeds. A setting that is similar to full-time 4-wheel drive (4WD). While the system powers all four wheels at all times and can be used full-time on all surfaces like full-time 4WD, the difference is that a “4-low” setting isn’t available on AWD vehicles. Due to the lack of “low range,” AWD vehicles are much less capable off-road than full-time 4WD but work perfectly well on well-maintained or paved surfaces. This setting operates naturally like a two-wheel drive vehicle. The key here is that unlike the full-time system, part-time 4WD doesn’t use a center differential. Instead, the system locks the front and rear drive shafts. It’s used exclusively during off-road travel or challenging road conditions. However, if a driver uses part-time 4WD excessively, they may experience driveline noise or binding that can lead to overheating or early part failure. Therefore, when driving under normal conditions, a driver should switch to the vehicle’s two-wheel-drive mode. This setting operates primarily in two-wheel drive during normal driving conditions. When a slick or slippery surface such as snow or mud is encountered, 4WD is automatically engaged and power is transferred to the secondary axle. This position is for normal, everyday driving when the pavement is dry. In normal conditions, nothing else is needed. This position is for normal speed driving but when you need a little extra traction like on dirt roads, hard packed sand, or slick, snowy, icy roads. Your front wheels and tires will add traction to increase your vehicle’s stability on loose surfaces. This position is used when you need maximum traction and maximum power at slower speeds such as rocky surfaces, deep mud or snow, steep or sharp inclines/declines, etc. Your front and rear wheels are engaged in low range using the lower gear ratio, resulting in slower road speed and higher torque. This provides your vehicle with better engine braking and allows for easier control. If the pavement or ground is wet, slick, or loose and you need to switch to 4WD, slowly and firmly pull the lever back one position. This will successfully swap you into 4 Hi. When you need maximum traction and want to move into 4L, slow your vehicle down to 2-3 mph. With the vehicle still rolling, gently shift into neutral and slowly and firmly pull the lever all the way back. Put your Jeep back into gear and you’re good to go. Pro Tip: Once you’re familiar with gearing, you can begin tweaking some factory settings. A simple move like changing tire size can make a difference. 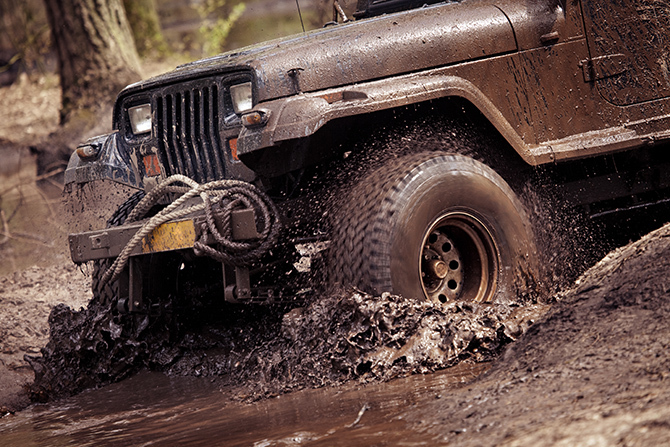 No matter the terrain or road condition, you can get the most out of your Jeep when you understand the basics of transmissions, transfer cases, and gear positions. TireBuyer carries an impressive stock of tires for your Jeep plus we offer fast and free shipping. You can easily shop by size or model/year online or call our tire and wheel experts at 866-961-8668 for help finding the perfect tire.